Melt the chopped chocolate, condensed milk and Olio Himalayan Pink Sea Salt in a double boiler on low heat. Put the nuts into a freezer bag and bash them with a rolling pin, until broken into both big and little pieces. Add the nuts (if using) to the melted chocolate and condensed milk. Stir well. Remove from heat, add the Olio Espresso Balsamic and instant espresso. Stir until combined. 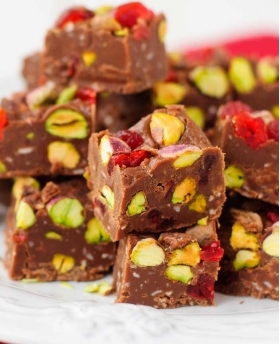 Pour this mixture into a 9-inch square foil tray, or lined with foil, smoothing the top. Let the fudge cool and then refrigerate until set. You can then cut into small pieces, as desired. Once cut you can keep fudge pieces in the freezer. No need to thaw, just eat straight away.